Thank you for believing in the policies of my DFM led Government. Reforming the nation meats that we had to take less popular measures too but we did this to improve our Republic to become stronger. In the end you rewarded us by re-electing me as your President and by giving my party an absolute majority (again). My People, let me assure you: The job isn't finnished yet, we've just started! The election results are just fantastic and it's a great honour to serve you and my country for a third time in a row. Your confidence gives me strength to be your Head of State again. However, this will be my last term in Office. It's time for a new generation to rule our Republic. Kirlawans, Prime Minister Grundbach just assured me that his third cabinet will respect the election outcome and therefore will continue to reform our beloved nation into a free and prosperous Kirlawa. President Edwin Ferdinand Wertham ." Leftists opposed to "terrifying" healthcare reforms; possible public sector union strikes? A new healthcare reform bill newly introduced into the General Assembly has been condemned by the leftists within the Assembly. The measured introduced by the government would abolish the Kirlawan Health Service (the KHS), as well as eliminating government support for prescription drugs. This measure is virtually guaranteed to pass the assembly due to the absolute majority held by the DFM government. Callum Lucas, leader of the KDL, contemned the bill in the assembly last week. In a statement released from temporary KDL offices in Indrala, Lucas was reported to have condenmed the new reforms as "a terrifying prospect". "With a falling population and reduced birth rates, we should be supporting our increasingly older population; not condemning them to a life of illness" He said that the first priority of any government that the KDL was elected to would be "the restoration of the KHS to its former glory as a world-class health service". The measures were condemned by the Kirlawan Public Service Union (the KPSU), the largest union dedicated to public sector staff. The KPSU has workers within many current and former public services, including support staff within Kirlawa's schools, medical technicians and ancillary staff within the KHS, and support staff in most other public services. The KPSU is required by law to ballot for this strike, and is believed to be announcing a ballot for a strike within the next week. The KPSU is believed also to be attempting to affiliate itself to the KDL, Kirlawa's only socialist party inside the General Assembly. A key figure within the KPSU, who wished to remain anonymous, said to us that "The government's policy on all public services is harmful to all of Kirlawa, and this attempt to destroy the KHS is really the last resort. The right to strike is the only way for us to force the government to change to support the public sector and not to continue to destroy it." Mc Bride:"Common Sense Is Needed Now"
Today, the Minister of Health and Social Services, mr. Sean Mc Bride, responded to KDL's condemnation of the health reform. The minister understands the expressed worries of the opposition party, the Union and medical staff but said that the current KHS has become too expensive, less effective and lacked any innovation. According to Mc Bride, a major reform was needed in order to keep our health care system working for everyone. That's why the Government proposed the introduction of free market idea's but also want to give people the opportunity to insure themselves against medical costs. The Minister called upon all parties involved to experience the new system first before making any conclusions. He also invited senior KPSU officials to his ministry to have talks about the reform. It's not clear if they accepted his invitation. Election results show Leftist victory; negotiations provide "a Government fair for all"
Final Election results show a victory in the Assembly Elections for Leftist parties, although the presidency remained under the control of the DFM. Confirmed results show that the DFM remains the largest party with 47% of the popular vote, and KPJP recieved 40% of votes, while the KDL recieved almost 13% of votes. This result is a defeat for the former majority DFM government, and it is almost guaranteed that a left-wing coalition consisting of the People's Justice Party and Democratic Labour would be formed. A Left-Wing coalition would have a clear majority of 51 within the General Assembly, ensuring that leftists would have a clear majority for all coalition policy. The success of the left-wing coalition has been attributed to the differences that exist between the KPJP and the KDL. The KDL's strong leftist economic views attracted economic leftists from the KPJP, whilst its socially liberal attitude gained votes from the DFM. Both of the "main" parties within Kirlawa saw votes go to the KDL, which saw its votes almost double. One surprise existent within the coalition agreement was that the position of Prime Minister would be awarded to KDL leader Callum Lucas, and not KPJP leader Eithne Thornton. Lucas and the KDL only re-entered the assembly three years ago and, despite growth in past elections, are still far smaller than the KPJP, who have dominated Kirlawan politics in recent years. However, many of the "powerful" government roles, such as finance, justice and foreign affairs are to be held by Peoples Justice Party representatives. Cabinet Members are to be confirmed at a later date. The DFM, althouth defeated, can still take some hope from this election results. The DFM remain the largest party within the assembly within 333 of the 717 seats, relatively close to an overall majority figure. This seems likely to continue since lost DFM voters seem to go to the smaller KDL and not the larger KPJP< who are the DFM's main opposition. The DFM remain the largest party in three of Kirlawa's five provinces, including gaining almost three-quarters of votes in Nuchtmark. Additionally, voters seem to trust the DFM in terms of international issues. Gerhard Grundbach of the DFM was elected to his first term as President of Kirlawa, the fourth consecutive term of DFM control of the presidency. He defeated combined KPJP-KDL candidate Tristina di Lauro by almost 10% of total votes. On the other hand. DFM support went down in the Assembly Elections by over 4% of votes; most of which going to the KDL; a party with very different views in many areas. Although the KPJP will form a major part of the governing coalition; they have not done as well as they themselves may have been hoping. Their vote remains above 40%; although it has gone down by just over 1%. However, this vote has gone to their coalition partners, the KDL, and not to parties outside the left-wing coalition. The KPJP remain as leading party in two of Kirlawa's provinces, although they were within half a percent from leading in Dirguzia. However, the KPJP fall to third place behind the KDL in Merkan, historically the most left-wing province in Kirlawa. The KPJP also suffered a humiliating defeat in the Presidential Elections, with Tristina di Lauro unable to defeat a new DFM candidate even with the support of the KDL. The KPJP have to hope that the new leftist government is able to gain large support of the people of Kirlawa. Arguably, the KDL were the only truely successful party in this election. The KDL were the only party to have their support increase, with an additional 45 MAs across the vast majority of provinces in Kirlawa. The KDL are represented in four of Kirlawa's five provinces, with the KDL defeating the KPJP in Merkan. The KDL have regained their first MAs in Nutchmark, the base of the DFM, and in Uwakah, the traditional base of Kirlawan leftism. These successes seem to have allowed the KDL to return the government after only 3 years within the General Assembly. The KDL, however, are not represented at all in Dirlana, gaining an extremely small number of votes. Also, there voters are not completely willing to support their coalition partners if asked; the DFM seemed to have attracted a majority of KDL voters despite the endorcement of di Lauro. "Der Zweifel am Siege entschuldigt nicht das Aufgeben des Kampfes." Indrala, Merkan - Kirlawa is besieged. Assailed by leftist multiculturalism, the proud history of the Kirlawan nation has been forgotten. Artanian values have been destroyed and the Kirlawans' native tongue has been abandoned in favor of a baseless fetishism for Terran. Only by rediscovering and embracing its Artanian heritage can Kirlawa ascend to become the power that it by rights should be. So goes the platform of the newly founded Kirlawische Nationale Allianz (Terran: Kirlawan National Alliance), a grouping of right wing populist parties dedicated to Pan-Artanian federal nationalism. The diminutive party has quickly become one of the most active bodies in Kirlawa, as it proposed and moved more legislation to vote in one month than was proposed by all parties in all of 3408. Some experts believe that this activity will be successful for the KNA long term. KNA Chairman Baldur Kolbe is the popular former mayor of Ecolo, Merkan. While the KNA has never previously contested politics nationally, several of its high ranking members have held local level positions. The most prominent member at current is Baldur Kolbe, whose tenure as mayor of Ecolo was popular, particularly amongst Artanian constituents. Kolbe was elected chairman of the KNA by unanimous vote, and is the Alliance's candidate for the position of Prime Minister. The nascent party believes that its message will resonate with both "White North Artanians" and "Dundorfians." In fact, says KNA Director of Public Relations Gerhard Stein, the two are the same. "The concept of 'White North Artanians,' descended from some non-existent 'Englar' people is a leftist fallacy," said Stein to reporters outside of the KNA headquarters in Indrala. "The Kirlawan censuses for centuries have been contrived by leftists to confuse the population and give credence to leftist adherence to the Terran language. There is no scientific base for this split. The Kirlawan people are descended from Dundorfians; they are Artanian. Kirlawan is a Rhaetan language, an Artanian language. Only by rejecting this leftist schism between the fabricated 'White North Artanians' and their Dundorfian brothers can the full might of the true Artanian ethnicity be realized." The KNA's initial bills are believed to be pragmatic in their approach; they are predicted to appeal to a large number of voters who feel dissatisfied with the many left wing parties of the current General Assembly. Chairman Baldur Kolbe does not wish to seem too optimistic, however. "It will take time for the Allianz to draw the attention of the Kirlawan people. But, as the saying goes, 'Der Zweifel am Siege entschuldigt nicht das Aufgeben des Kampfes.' We are committed to Artanian values, as we believe are many Kirlawans, and we will be successful in the long term." Mygee, Dorvish-Uwakah - Uwakah, one of the smallest provinces in the world in terms of land area, is home to only one significant port - Micana - but the tiny, rural northwestern forest land has seen some of the most significant events in Kirlawan history. A large portion of northern Uwakah, known in the 2300s as Dorvish-Uwakah, maintains its proud Artanian heritage through an annual celebration called Oktoberfest. The festival is a two and a half week remembrance of Kirlawa's Artanian ancestry, with indulgences of all kinds: traditional foods, music, sporting competitions, culminated by an enormous parade attended by hundreds of thousands from across Terra. This year, the celebration of Oktoberfest has taken on a less common weight: the politicization of Artanian nationalism by the Kirlawische Nationale Allianz ahead of July's coming election has lent the festivities an importance not known before. The KNA, newly formed and intensely active on the Kirlawan political scene, has received significant support from sources in places as varied as Dorvik, Valruzia, and Saridan. The Artanian Order, an international society that aims at furthering the Artanian peoples, has also pledged its support for the cultural movement in Kirlawa. The support has been "overwhelming," said KNA Chairman Baldur Kolbe. Kolbe, previously the little known mayor of Ecolo in Merkan Province, has met, in the past year, with such dignitaries as the Dorvish President Yaroslav Markovic and Valruzian Foreign Minister Joanna Hawry. This international support has swelled the KNA's coffers, and the party quickly capitalized on one of the largest Artanian heritage events on Terra by contributing significantly to the festival. Preliminary numbers from organizers show that the popularity of the celebration has surged, with over one million visitors anticipated for the first time in the festival's long history. 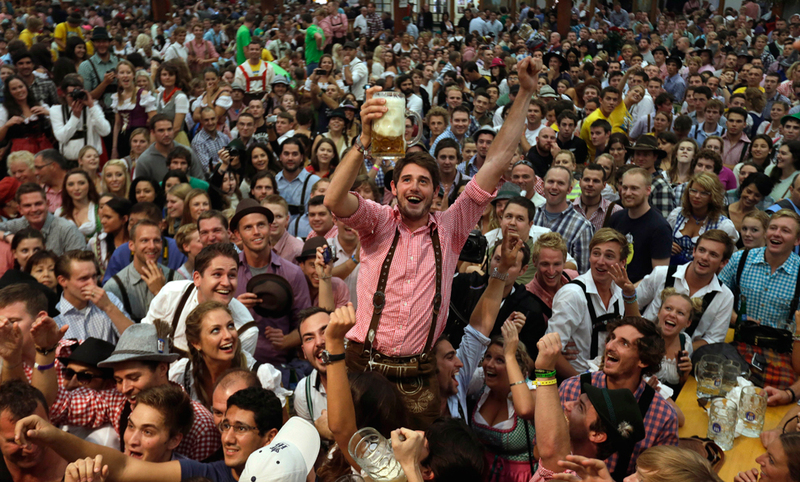 Many KNA figures were present at Oktoberfest, alongside foreign dignitaries. A large cadre of Dorvish Conservative Party observers were entertained by KNA Director of Public Relations Gerhard Stein, and Valruzian Supreme Chancellor Krzysztof Wada was notably enrolled in an eating competition where he was photographed stuffing his face with schnitzel and downing it with fine Ukawahan beer. Interestingly, Maurice Khwetsube, Saridani Minister of Trade and Industry, was spotted in the company of KNA Director of Finance Aloisia Beyer, hinting at an interest on the part of the party in establishing relations with the communist nation. While experts initially doubted the Kirlawische Nationale Allianz's electability, the party's quick acquisition of foreign recognition and funding has led to a surge in the party's popularity. Coupled with the nascent organization's activity in the General Assembly, some are beginning to believe that the cultural movement in Kirlawa may take hold. Indrala, Merkan - A group of Kirlawa's most respected historians, anthropologists, linguists, and geographers have congregated in Indrala for the presentation of a large body of research on the descent of the Kirlawan peoples. The research was undertaken independent of the political weight placed on the ethnic and cultural debate recently, but the conclusions of the Indrala Symposium dramatically supported the claims of the Kirlawische Nationale Allianz, leading Chairman Baldur Kolbe to congratulate the scientists on their noble contribution to the rightful Artanian cause, and KNA Secretary, Ansgar Baumann (Master of the Artanian Order - Kirlawan Chapter, though this title is contested following the left wing, Terran-affiliated take over of the Artanian Order) to name the research as "the most important of its kind in Kirlawan history." The keynote presentation was delivered by Dr. Gottfried F. Kirchner, Professor Emeritus of Anthropology at the University of Merkan. Dr. Kirchner declared triumphantly that there was no anthropological basis for the separation of the "White North Artanian" and "Dundorfian" ethnicities as has been done on all Kirlawan censuses since 2410, and unofficially since before that time. "The Dundorfischer," stated the doctor to his rapt audience, "are the oldest ethnicity in Northern Artania, descended from the ancient Durvin peoples, who spread across Artania long ago and into Kirlawa specifically beginning with raids as early as 320 years before the common era, which is when the first instances of Dundorfischer weaponry are found in the archeological record in Kirlawan soil. "In the 2300s this commitment on the part of Dundorf to its Dundorfischer foundations led the government of Dundorf to support the ethnic Dundorfischer of Kirlawa's Merkan province during the Kirlawan Civil War. In northwestern Kirlawa, a similar movement of Artanian solidarity was witnessed in Dorvish-Uwakah, where Artanian brothers from Dorvik supported the Dundorfischer-descended Kirlawans in Uwakah. "The great tragedy of this war was that 'White North Artanians' were pitted against their Dundorfischer brothers militarily for the first time. The pseudo-ethnicity, speaking Terran for no discernible reason aside from government ignorance (as my previous comments have shown, the proper language would have been Dundorfische), were tricked into bearing arms against their own countrymen. In this way, pseudo-science was utilized to warrant the destruction of great amounts of life and has been since used to warrant the destruction of Kirlawa's rightful Dundorfischer culture." Dr. Kirchner's remarks were met with unanimous applause from his peers, and several further papers and presentations supported his thesis. Other major papers focused on the mechanics of the unnatural adoption of Terran as the "official" language of Kirlawa (largely attributed to the same pseudo-scientific bases cited by Kirchner), the mistreatment and continued denial of Dundorfischer culture on the part of Kirlawa's government, and selected specific historical pieces detailing daily life as a Dundorfischer in Dorvish-Uwakah or Merkan, two of the most significantly Dundorfischer areas of Kirlawa. Mygee, Dorvish-Uwakah - Another enormous Uwakahan Oktoberfest saw massive interest from across Terra, with Artanians and Dundorfischers coming from as far as Hulstria to celebrate the glorious cultural revival sparked by the Kirlawische Nationale Allianz in Kirlawa. The event was sponsored once again by the KNA, whose profile has grown significantly since their first involvement in the festival seven years ago. In the intervening time, the Alliance has become the largest party in the Kirlawan General Assembly, claiming both the positions of President and Prime Minister, along with many cabinet positions. The event was saddened somewhat by Prime Minister Baldur Kolbe's announcement that he will retire from public service following July's general election. Many experts have begun wondering aloud who will succeed Kolbe as Chairman of the KNA and Prime Minister of Kirlawa. Gerhard Stein, the KNA's General Assembly leader, seems to be the favorite for the former position, though the latter is more disputed. Indrala, Merkan - The Dorvish Minister-President, Lyudmil Kovachev, has left Indrala after meeting with the Kirlawische Nationale Allianz governors of Merkan, Dirguzia, and Nuchtmark, along with Kirlawan Minister of Foreign Affairs Georg Kneller. The meeting was kept relatively low key, with the Minister-President traveling to Indrala following his appearance at Oktoberfest. The topic of the conversation is believed to have been Artanian culture and the Artanian Union, along with Dorvish promises of support for those Artanians whose heritage had been suppressed for centuries prior to the ascent of the KNA. The KNA has received massive financial support from Haldor, and the Alliance has close ties with the ruling Dorvische Konservative Partei. Indrala, Merkan - The leader of the Kirlawan Conservatives, Greg Shields, today released his party's election manifesto and urged Kirlawans to "be bold, vote Conservative". Shields stated that the Greens and the KPJP had "become extremely stagnated and out of ideas" and that "Kirlawans were craving a new, visionary political force". He made pledges including a commitment to lowering income tax, sales tax, and corporation tax, as well as the "reintroduction of common sense and decency in the realm of social affairs". Shields went on to announce his party's determination for Kirlawan membership of the Artanian Union and the upkeep of a strong and well-disciplined defensive military force. He also spoke passionately about his desire to see a "WMD-free Kirlawa" that would act as a springboard towards a "safer, more humane world". Shields also described his party as "the most positively radical and revolutionary party Kirlawa has seen in modern times". However, the charismatic leader declared that his party would not be "yet another centrist flop" and that "it will ensure it offers something 'different' to voters". On the Green Party and the KPJP he launched a scathing attack against them declaring both parties to be "outdated and irrelevant to Kirlawa's future". Such strong words, however, could potentially ruin his party's chances of participating in the next government.